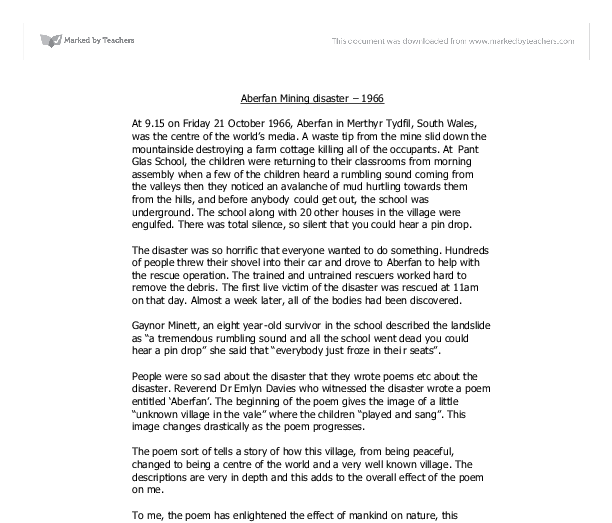 Aberfan Mining disaster - 1966 At 9.15 on Friday 21 October 1966, Aberfan in Merthyr Tydfil, South Wales, was the centre of the world's media. A waste tip from the mine slid down the mountainside destroying a farm cottage killing all of the occupants. At Pant Glas School, the children were returning to their classrooms from morning assembly when a few of the children heard a rumbling sound coming from the valleys then they noticed an avalanche of mud hurtling towards them from the hills, and before anybody could get out, the school was underground. The school along with 20 other houses in the village were engulfed. There was total silence, so silent that you could hear a pin drop. The disaster was so horrific that everyone wanted to do something. Hundreds of people threw their shovel into their car and drove to Aberfan to help with the rescue operation. The trained and untrained rescuers worked hard to remove the debris. ...read more. I would have never known this "secluded village". 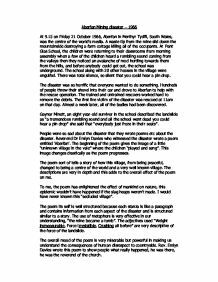 The poem its self is well structured because each stanza is like a paragraph and contains information from each aspect of the disaster and is structured similar to a story. The use of metaphors is very effective in our understanding, "the mine became a tomb". The adjectives used "Weight immeasurable, Force irresistible, Crushing all before" are very descriptive of the force of the landslide. The overall mood of the poem is very miserable but powerful in making us understand the consequences of human disrespect to countryside. Rev. Emlyn Davies wrote this poem to show people what really happened, he was there, he was the reverend of the church. Mike Jenkins wrote two poems about the disaster at a much later date. He was influence to writing one of them 'He loved light freedom and animals' when he visited Aberfan. He was walking through a graveyard and he noticed one of the headstones and it read 'He loved light, freedom and animals' he was touched by the inscription and wrote a poem with the caption as the heading. ...read more. picture of what happened and he comes back to reality and realises that the person buried beneath him is this little boy that he is imagining. As the poem unfolds, the descriptions get more vague. He seems to be highlighting the main features of his imagination. The gravestone that he found hugely inspired Mike Jenkins. I think that his purpose was not to persuade people to accept his views but just to let them envisage what he felt. The second Mike Jenkins poem is called 'Among the Debris'. It is written in a completely different style to 'He loved light freedom and animals'. He uses a local dialect, however, it is hard to understand but it adds a good effect. The first stanza tells us about a teacher who used to tell stories to the children "about is time in the navy, playin cards underwater" The second verse reveals that the teacher wasn't in control of his emotions. It seems to me that he had been through an experience that had mentally scarred him, because "ee'd go mental, throw a wobbly". ...read more. that the moon had not decided to grace us with its light tonight and the only glow was coming from the ship itself. While the first lifeboat was being lowered onto the floor, only a select few began to move towards it in an attempt to board it. The fierce raindrops also enhanced my terrorizing fear for the captivated area. My thick dark hair quickly became damp and my clothes slightly soaked. Walking a few paces I felt the blood inside of me very gradually building up speed in a fierce manner. Analyse, compare and contrast &amp;quot;Aberfan&amp;quot; and &amp;quot;suicide on Pentwyn Bridge&amp;quot;. My ever supportive, caring brother, he would do anything to help me get a story, to help me get further in my career. "Tom! You have to get help!" I yelled into the phone. "Rob, what's wrong?" he replied. "You've heard about the plane crash?" "Of course. Who hasn't?" Writing to narrate - Not What It Seems. I quickly bent down and grabbed it. He once again attempted to attack me but I just dodged in time. He stumbled for a few seconds, which made him vulnerable. I saw my chance and thrust the brick towards his head resulting in a blow with tremendous shock. As the tall dark figure of the man got up and headed towards the bar, the strong light from the fireplace illuminated his face along with the rest of him. He had spiked jet-black hair and dark brown eyes, but what made him stand out were his ears.